Conflict resolution skills are a job requirement for many different types of positions. That’s because conflict within organizations can reduce productivity and create a difficult work environment, leading to unwanted turnover in staff and reduced morale. When you prepare for an interview for a position where conflict resolution could be a factor, be prepared to share examples of specific times you helped resolve workplace conflict. Describe the issue you dealt with, what the problem was, the action you took to resolve the situation, and how you helped mediate or manage a solution. Here’s information on what workplace conflict is, how it can be resolved, and examples of situations where conflict resolution was necessary to solve a workplace problem. Conflict in the workplace typically involves differences of opinion, style, or approach that are not easily resolved. These can lead to hurt feelings and altercations among employees. Conflict may occur between co-workers, or between supervisors and subordinates, or between service providers and their clients or customers. Conflict can also occur between groups, such as management and labor, or between whole departments. Some conflicts are essentially arbitrary, meaning it doesn’t matter who “wins,” only that the problem is resolved so everyone can get back to work. But some conflicts reflect real disagreements about how an organization should function. If the winner of the conflict happens to be wrong, the organization as a whole could suffer. Some conflicts involve bullying or harassment of some kind, in which case a fair resolution must involve attention to justice. And if one party out-ranks the other, the power disparity could complicate resolution even if everybody concerned means well. Recognition by the parties involved that a problem exists. Agreement to address the issue and find some resolution. An effort to understand the perspective and concerns of the opposing individual or group. Identifying changes in attitude, behavior, and approaches to work by both sides that will lessen negative feelings. Recognizing triggers to episodes of conflict. Interventions by third parties such as Human Resources representatives or higher level managers to mediate. A willingness by one or both parties to compromise. Agreement on a plan to address differences. Monitoring the impact of any agreements for change. Disciplining or terminating employees who resist efforts to defuse conflicts. 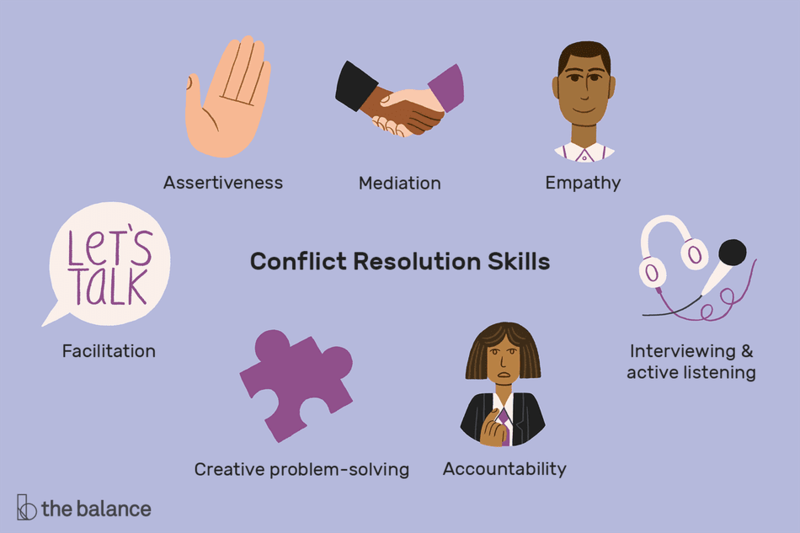 The following skills are often important in conflict resolution. Each is presented here with hypothetical examples of how this skill might be used in the workplace. The list is not exhaustive, and of course, many more applications of each skill are possible. A supervisor might take the initiative to convene a meeting between two employees who have engaged in a public dispute. An employee might seek out a person with whom they're having conflict to suggest working together to find ways to co-exist more peacefully. A Human Resources representative might have to ask questions and listen carefully to determine the nature of a conflict between a supervisor and a subordinate. A mediator might encourage empathy by asking employees in conflict to each describe how the other might be feeling and thinking and how the situation might look to the other party. Empathy is also an important skill for mediators, who must be able to understand each party’s perspective, without necessarily agreeing with either. Managers of rival departments might facilitate a joint brainstorming session with their teams to generate solutions to ongoing points of conflict. Group facilitation techniques can also be used to avoid triggering conflict during group decision-making, to begin with. A supervisor might guide subordinates who are in conflict through a process to identify mutually agreeable changes in behavior. A supervisor might redefine the roles of two conflict-prone staff to simply eliminate points of friction. Creativity can also mean finding new win/win solutions. A supervisor might document conflict-initiating behaviors exhibited by a chronic complainer as preparation for a performance appraisal. In this way, the supervisor helps establish accountability, since the employee can no longer pretend the problem isn’t happening.